Share experiences in a whole new way. 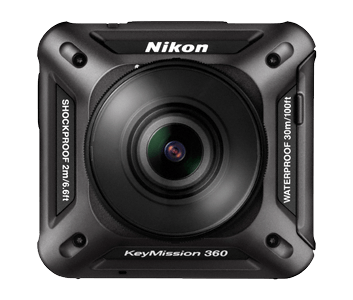 KeyMission 360 uses two Nikkor lenses and two image sensors to capture the view in front of your eyes as well as scenes you can’t see—including yourself within the 360° world—with brilliant Nikon image quality. The results are 360° videos and photos that will make your friends and family feel as if they were actually there. The camera may be unable to capture subjects within about 60 cm/2 ft from the camera’s top, bottom, or sides because the subjects are outside the angle of view (i.e., the area visible in the frame). Point the lens toward important subjects when shooting. Under some shooting conditions, the boundaries of the composited areas may be misaligned. Follow your storytelling instincts everywhere they take you. With no additional housing, KeyMission 360 is waterproof down to 98-feet*, freezeproof down to 14°F and shockproof up to a drop of 6.6-feet. Create immersive 360° videos of a child's first bike or sled ride, a skiing or snowboarding run, cannonballs in the pool, fun at the beach, snorkeling and diving adventures—any experience you want to relive and share. Compact and lightweight, KeyMission 360 can be mounted just about anywhere. It includes a standard 1/4-inch socket for attaching to existing accessories, and Nikon offers more than 10 versatile mounting accessories: adhesive and suction mounts, helmet and wrist straps, a chest harness, KeyMission extension arm, handy grip and more. Find unique angles for every mission.